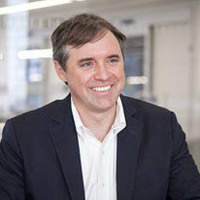 President of Novartis Institutes for Biological Research and former associate director of the Center for the Science of Therapeutics at the Broad Institute of MIT and Harvard University, James Bradner is a well known advocate for open source science. He is now carrying that vision into Big Pharma. He is known for genetically engineering new molecules that get cancer cells to "forget" that they are cancer cells and then giving that information away, instead of keeping it a secret.